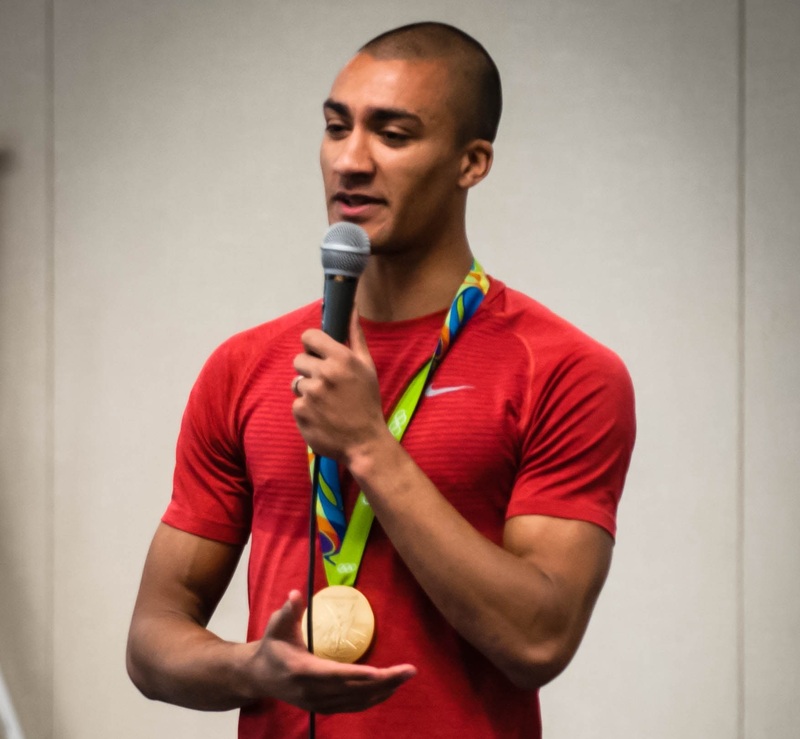 The excitement was palpable when U.S. Olympian Ashton Eaton visited Bullis Charter School earlier this month. Eaton is a decathlete and two-time Olympic champion, winning gold at the 2012 and 2016 Summer Olympic Games. He is often referred to as the “World’s Greatest Athlete” for his dominance in the 10-event decathlon and his world records in both the decathlon and indoor heptathlon. Eaton visited Bullis Charter School to share his story of hard work and success and in turn inspire students to pursue their own dreams. Eaton spoke to students at K-5 assemblies on both the North and South campuses and at a special middle school assembly. He described how he developed a passion for his sport while playing in his own backyard as a child, literally jumping over a stick and measuring success through small, incremental steps. Eaton discussed the importance of healthy eating and how learning to take care of his body furthered his success in his sport. He also emphasized the importance of gratitude and graciousness. Eaton said he could fill the entire assembly room with the people who have supported him and helped him reach his goals. “If you’re a winner, you have to understand you did not get there on your own,” he said. At the end of each assembly, applause erupted when Eaton pulled his gold medal from his pocket and placed it around his neck. Eaton spent the remainder of his time at Bullis Charter School teaching a seventh-grade PE class and reviewing and judging an eighth-grade “School of the Future” design competition. The activities provided students the opportunity for interaction with the Olympian. In the PE class, Eaton demonstrated a variety of physical strategies to improve running speed and wowed the students with his javelin-throwing technique. He then divided the students into groups and put them through several decathlon training exercises, offering encouragement and high-fives along the way. “I never thought of myself as someone who had the ability to be a good long jumper, but after listening to the world’s greatest athlete speak to our class, and in particular his positive words for me after watching my long jump, I am now inspired to push myself in the long jump,” said seventh-grader Anushka Srinivasan.